When I was in my early twenties, I had never read a book solely for enjoyment. That changed after I met my wife. Shortly after we were married, she gave me the novel The Shining by Steven King to read. The next book she gave me was The Firm by John Grisham. I enjoyed reading both books. So, I decided to go to the bookstore to see if I could find something on my own. I picked Arthur C. Clarke’s 2001: A Space Oddyesy. I have been an avid reader ever since. It is one of only a handful of books that I have read more than once. I read it again this month in recognition of the fiftieth anniversary of the film. It’s still a great book. The film is another matter. I had always thought that the book was a novelization of the screenplay. 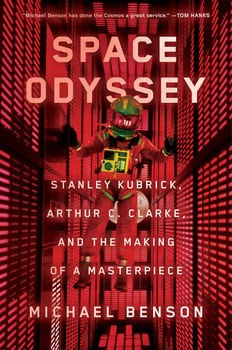 In the excellent book Space Odyssey: Stanley Kubrick, Arthur C. Clarke, and the Making of a Masterpiece, I learned that the book came before the screenplay, which was written by Stanley Kubrick. I found the behind the scenes material an interesting read. The book looks at the genesis of the story, with Stanley Kubrick seeking out Arthur C. Clarke for his help in making an original science fiction movie. The book then delves into the collaboration of the two men as well as a thorough examination of how the many special effects in the film were achieved. One observation I came away with after reading author Michael Benson’s book was how Stanley Kubrick could waste thousands of dollars on a set piece or a special effect that didn’t pan out but would balk anytime someone working for him asked for a raise. I came away thinking that Stanley bought into the whole “genius director” moniker that some believed him to be. After reading the details on the making of the film, I had to view it again with my new perspective. Did I come away thinking that 2001: A Space Odyssey is a masterpiece? Sorry, this film is not even close to being a masterpiece. Here are just a few reasons why. The film is two hours and twenty-eight minutes long. Of that running time, there are only forty minutes of dialogue. And much of that dialogue is wasted. There are another five minutes of nothing but a black screen and a soundtrack. Every scene moves at a glacial pace. One of the worst scenes in the film is when Dr. Heywood Floyd is speaking in a conference room. Stanley is so impressed with his set that he spends way too long with the entire conference room in frame. You can barely see poor old Floyd in the back of the room. Then, instead of using that scene to talk about the strange discovery found on the moon, he rambles on about a cover-up story. What cover-up story, Stanley? You haven’t explained anything. One thing I learned in screenwriting classes is that every scene needs to serve one of two purposes: the scene needs to either advance the story or provide character insight. Many of the scenes in 2001 do not accomplish either goal. Much of 2001 is pretentious and self-indulgent. Stanley Kubrick ruined Steven King’s The Shining. He is responsible for one of the worst movies ever made – Eyes Wide Shut. Stanley Kubrick had one skill – he knew how to operate a camera. He was not a writer. He couldn’t tell a coherent story if his life depended on it. Want another example of a supposed genius director given free reign on writing and directing a film, look no further than Christopher Nolan’s Dunkirk. I will say that the story that Stanley and Arthur C. Clarke came up with was imaginative. The book remains one of my all-time favorites. And some of the special effects in the film were revolutionary. But here again, Stanley took all of the credit. Making any movie is a collaboration. Stanley Kubrick was no genius director. If he didn’t have a great screenplay to work with, he couldn’t come up with an original idea. That’s just my opinion. Plenty of people still think that 2001: A Space Odyssey is a masterpiece. So too Dunkirk.